Note: I don’t review substandard books. I read a lot, but I don’t have a lot of time to review books, so what I do share, I’m sharing because the book has been not merely interesting but influential and helpful to me in my life, and I believe it will also help you. If you are a marketer or entrepreneur, these are must reads. You won’t believe how much modern business and military strategy owes to this guy. Tags: Lean startup, customer feedback, ooda loop, strategy, biographies, startups, entrepreneurship, military. People always seem to have the upper hand on you. You’re doing a high tech startup. Strategy is key to what you do professionally. Regardless of your feelings about how these tools are used, if I told you that military drones, the A-10, F-16, and F-15, the OODA loop, and modern military strategy generally all originated with one man, would you believe it? If you’re not into military stuff, maybe none of that means anything to you. To put it in perspective…no, I don’t know how to put it in perspective. 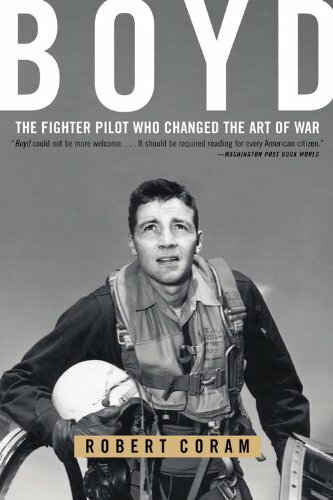 Simply put, John Boyd’s work and thinking changed the world you live in, and hardly anyone knows it unless they knew the guy or have read this book. Before I wallow in hero worship when it comes to Boyd, let me say he was something of a savant, and savants all seem to have some big flaws, and Boyd sure had his. He wasn’t much of a father or husband. He ruffled a lot of feathers in the military, smoking cigars, getting in the faces of those he was yelling at, and stabbing the lit end of his cigar into the other guy’s tie to emphasize his points. Many people thought he was a jerk. But man, was he a driven one. This book is a lesson in what hard work and dedication looks like, if nothing else. However, what fascinated me the most was Boyd’s development of the OODA loop. Imagine that you are on a ski slope with other skiers…that you are in Florida riding in an outboard motorboat, maybe even towing water-skiers. Imagine that you are riding a bicycle on a nice spring day. Imagine that you are a parent taking your son to a department store and that you notice he is fascinated by the toy tractors or tanks with rubber caterpillar treads. Now imagine that you pull the skis off but you are still on the ski slope. Imagine also that you remove the outboard motor from the motorboat, and you are no longer in Florida. And from the bicycle you remove the handle-bar and discard the rest of the bike. Finally, you take off the rubber treads from the toy tractor or tanks. This leaves only the following separate pieces: skis, outboard motor, handlebars and rubber treads. A loser is someone (individual or group) who cannot build snowmobiles when facing uncertainty and unpredictable change; whereas a winner is someone (individual or group) who can build snowmobiles, and employ them in an appropriate fashion, when facing uncertainty and unpredictable change. The OODA loop is something we all do hundreds of times each day, whether we know it or not. Boyd merely described it. But once one understands it, one can use it to his advantage. A key to maintaining advantage is to be able to orient effectively, but speed also matters. Those who can race through the cycle fast are able to make decisions and implement actions so quickly their competitors or enemies (to put it in military terms) can’t react fast enough, get confused, and lose, or die. Boyd’s theories wouldn’t be half as interesting if they weren’t couched within the author’s excellent telling of Boyd’s personal history. The story is fascinating by itself, but the technical aspect gives it instant application, and a framework for better understanding of how that application can be made. You will not only find this book useful, you’ll find it interesting.